We were delighted to provide the wedding flowers at Stancliffe Hall, Matlock, Derbyshire for the autumnal wedding of Cheryl and Andy. 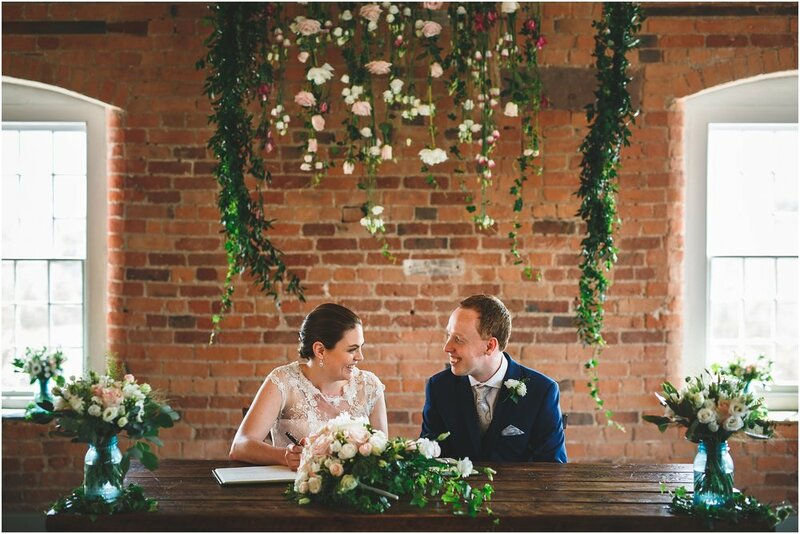 We initially met with Cheryl and Andy alongside Joy from Unique wedding planning to discuss the look and feel they wanted to achieve for their Wedding flowers at Stancliffe Hall, Matlock, Derbyshire. They wanted a relaxed, fun day with gorgeous and muted flowers. We discussed the use of muted pinks, peaches and creams for the relaxed and informal feel that Cheryl and Andy wanted to achieve with their wedding flowers. This included our all time favourite cream Hydrangeas, soft pink Roses, peach Roses, Bombastic spray roses and delicate pittosporum. Stancliffe Hall is a fabulous, luxurious wedding venue in Derbyshire, and has been lovingly restored and maintained by the current owners. The venue used to be a private school in Matlock, and the chapel is simply amazing. The cake was designed by our friends at Love Candy Cakes in Chesterfield. Candy always creates delicious cakes that almost look too good to eat! This particular cake was a very fashionable and yummy naked cake, which smelt absolutely delightful as we decorated the tiers with fresh flowers. The stunning images are by Emma White Photography and we hope you enjoy perusing them as much as we did. We worked alongside Michele Glehill venue stylist, who created the venue flowers. We worked together to ensure that venue flowers matched the bridal party flowers using the same varieties of Roses and foliage.